Nature’s Sunshine Sweet FX helps neutralize sugar, calm anxiety, and boost your overall mood. This feel-good formula contains L-arabinose, which helps block the absorption of sugar, and L-theanine to boost your mood and calm anxiety. Featuring antioxidant-rich cinnamon, Sweet FX also helps maintain healthy blood sugar levels already in the normal range. 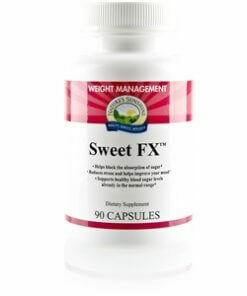 Whether you’re concerned about managing your weight or encouraging normal glucose balances, add some positive sweetness to your day with Sweet FX. Instructions: Take 3 capsules once daily, preferably before your largest meal, which for most people is dinner. Found naturally in some foods, L-arabinose is a unique monosaccharide, or simple sugar, that helps block the complete absorption of sugar in the body. In studies, taking L-arabinose with a high-carbohydrate meal seems to both delay and reduce peaks in blood glucose and insulin levels. Blood sugar control can play an important role in reducing feelings of hunger, making it easier to stick to a healthy diet. A potent antioxidant, cinnamon (Cassia cinnamon)bark extract has been shown to help maintain already-normal, healthy blood sugar and insulin levels in overweight individuals.